Get ready to dive headfirst into the mysterious and paranormal world of the Psychonauts for the first time in more than ten years, because Psychonauts in the Rhombus of Ruin is coming out on February 21, exclusively for PlayStation VR! 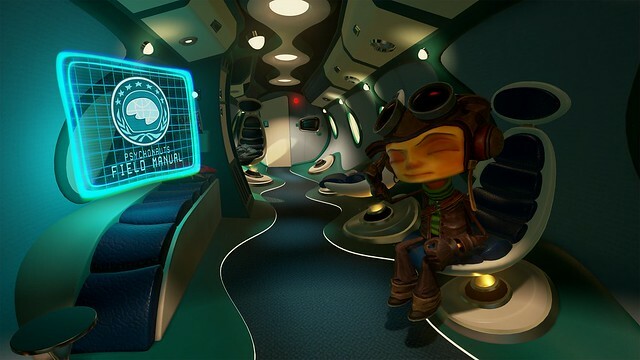 This is not Psychonauts 2; it’s a standalone chapter of the Psychonauts saga — a mind-bending adventure puzzle game made from the ground up for VR that will chronicle the events between the first Psychonauts and its forthcoming sequel. You’ll assume the role of Raz, an intrepid young psychic and now fully fledged member of the Psychonauts — an elite group of international psychic secret agents! You’ll see through Raz’s eyes in first person, using his various psychic powers to affect the world, and solve puzzles: the power of Clairvoyance will allow you to see through the eyes of others and explore the environment, while other abilities such as Telekinesis and Pyrokinesis allow you to move things around with the power of your mind… or just set them on fire. The story picks up exactly where it left off at the end of Psychonauts, with Raz, Lili, Sasha, Milla, and Coach Oleander flying off to rescue Truman Zannotto, the Grand Head of the Psychonauts. Their mission takes them straight into the heart of the Rhombus of Ruin — a mysterious part of the ocean as deadly as two Bermuda Triangles back to back! When the rescue party itself is kidnapped and held prisoner in the Rhombus, Raz is immobilized and must use only his psychic powers to reunite his friends, reveal the identity of the mysterious kidnapper, and free Truman before the madness of the Rhombus consumes all their minds! 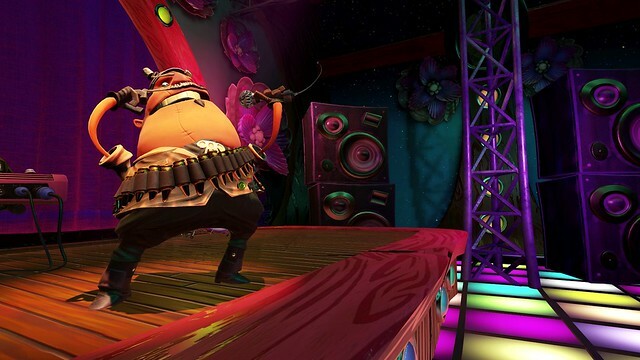 Psychonauts in the Rhombus of Ruin was designed to be as fun for long time fans as it is for people new to the franchise, so if you’ve never played Psychonauts before that won’t be a problem. You do have time to check it out before this installment arrives though, the original Psychonauts is available now for PS4 as a PS2 Classic! It’s hard to convey what a VR game will be like with just 2D screenshots, so we thought we’d try our hand at a fancy “3D screenshot.” These 3D video clips allow you to pan around 360 degrees and experience the world of Rhombus of Ruin first hand. Psychonauts in the Rhombus of Ruin is out on Feb 21! Thanks for supporting PSVR with your awesomeness. Nice idea but I am not planning to buy PSVR just for a handful of games. Hope they figure out a way to do it as non VR content. If you want us to buy VR games then let us by a VR headset! Haven’t seen one available in months. You know there is video (YouTube) that allows you to rotate your cell for a 360 degree panoramic view. Maybe you can control the view using the mouse for PC’s. Indeed you can pan around the video with mouse on a computer, or hold it up on your phone. By the way, this video has stereoscopic 3D support, which means you can put on red/blue 3D glasses to watch it in 3D! Awesome. Shall be grabbing this day 1. Really excited about this. I haven’t played the first game yet, been meaning to get around to it. Is it needed to know what is going on or to truly enjoy the experience? Gotta play catch up on my Tim Schafer games. Thank you for supporting VR, i’m currently loving my PSVR. Will this include PlayStation 4 Pro patch? VR games like Rigs, Bound, and Robinson have benefited greatly from the improvements on Pro. Pro patches definitely play a factor in my purchases. Also, will it have a platinum trophy? Good question! Yes there are some PS4 pro enhancements – It runs at a higher framerate, with higher resolution textures, and there are some other graphical improvements also. Alas there is no platinum trophy though. The actual PS4 pro enhancement is that we render at a higher resolution which makes the game looks much crisper and clear. wow! been so long since i played the first game on the PS2! Can’t wait to see the characters again. Thanks! oh, is it retail or download only? Download only, although there’s a chance it might get a retail release a bit later on, we’re in conversations about that now. I am super SUPER excited for this…My favorite voice actress Nicki Rapp is returning as Lili!!!! Here is a link to her facebook page! she is Amazing! Send her a friend invite and she will even respond! Love her to death!!!! Can wait for more Psychonaughts!!!!!! 10 long years we missed the hell out of you Raz. DAY ONE!!! Thank you, been looking forward to this one! Also curious if this will be digital or physical as well? Too bad this is VR exclusive. I think a lot of people would have picked this up (including me) if it was playable without PSVR as well. Disappointing since DF have traditionally made games for everyone, not supporting a niche gaming device (when a peripheral costs more than the system required to use it, it’s niche). Sony must be paying well for this for a fraction of its user base. Are we going to start seeing Pro exclusive titles soon? What a whiner that one. No they will not make Pro exclusive games. They said they wouldn’t. But they are also going to support their new device with games, and owners of said device are happy to be getting some games for their investment. Sony doesn’t work just for you. You have not played games until you play in VR. Throw away everything you know about gaming. If you are serious about video games then invest in PSVR. Great to get more VR content …. curious as to length of game and price point. Will be looking forward to release. Psychonauts is one of those games people like to rave about it. It wasn’t a bad game, but it was far from a great game. For me it was fun for the first couple of hours, but then it quickly lost my interest. It reminds me of another Double Fine game, Brutal Legend. It was innovative, quirky, but honestly just not a fun game to play. Both Psychonauts and Brutal Legends were complete flops on the console. Wow, now I know what it sounds like when I talk about Firefly. Still I think you are only half right as brutal legend is interesting but not great. But I sill finished as I am easily entertained by most games that at least try to have a story without surrounding me with people I only hate. (looking at you Borderlands) Still saying that it was a flop and that being able to play it on ps4 is a bit too far. It was more of a cult classic than a flop and could have been as big as the other action-platformer games that made there mark on the ps2 (ratchet & clank, Jack & Daxter, ect) if it weren’t for whatever it was that caused such low initial sales. Still as of 2015 its sold almost 2M copies which is probably more that that of other games from the time. Just did a look up and I will admit it had some compaction at the time for players money and atention. Big name games that came out include Midnight Club 3:dub edition (which I still consider to be the best street racing game ever), Pokemon Emerald, Guild Wars, Jade Empire, Doom 3, , and Shin Megami Tensei: Digital Devil Saga. All of which are well known games. Yes, yes~! Predict endlessly that Sony will abandon PSVR every week that a game doesn’t come out for it, then when we get announcements of PSVR exclusive games, complain that there aren’t enough games on PSVR to make it worth buying and that the game should be available without VR. All of you that do this aren’t being hypocritical at all… NO SIR! Never played Psychonauts. Did buy it in recent sale. Should I play that before I play this PSVR title? Depends if you want to have any frame of reference and how often they talk about the events of the previous game..
Is this a digital Release Only?